1 of 1 Stir together cookie crumbs, butter, sugar and salt in a medium bowl. Press into bottom and up side of a 9-inch pie pan (not deep dish). Refrigerate while preparing filling. 1 of 4 Chop 21/2 of the chocolate bars. Combine eggs and 1/3 cup of the sugar in a large metal bowl or double boiler. Bring 2 inches of water to a simmer in a large pot or Dutch oven. Place bowl or double boiler over pan without touching water. Cook, beating constantly with a hand mixer, until mixture is light colored and fluffy, and registers 160 degrees on an instantread thermometer, 5 to 6 minutes. Watch carefully; if eggs get too hot, they will scramble. 2 of 4 Remove bowl from heat. Whisk in chopped chocolate and cocoa powder until smooth. Set aside to cool for 15 minutes, whisking occasionally. 3 of 4 Once egg mixture is cooled, combine remaining 1/3 cup sugar with the butter and salt in a large bowl. Beat on high speed until very light colored, about 2 minutes. On medium, beat in egg mixture, scraping down side of bowl. Fold in half of the whipped topping and spread into prepared crust. Refrigerate overnight. 4 of 4 Just before serving, spread center of pie with remaining whipped topping. 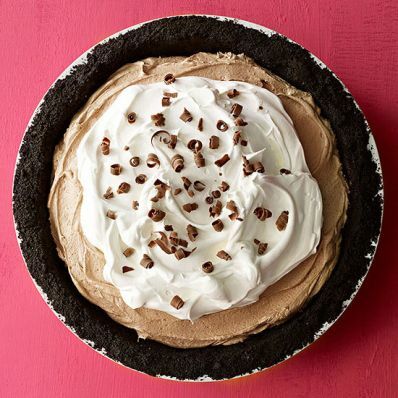 Use a vegetable peeler to make large curls from reserved chocolate, or cut into shards and sprinkle over pie.